William Henry Berkeley was aged 18 years and 6 months when he enlisted on 13 July, 1915 and was attached to the 8th Battalion, 1oth Reinforcements. he was by trade a joiner and had served a six year apprenticeship with H. Beauchamp, Lonsdale St., Melbourne. He had also trained with the Citizen Military Forces for four years, training at the Drill Hall in East Melbourne, on the corner of Victoria Parade and Powlett St. He embarked on the HMAT RMS 'Osterley' on 29 September, 1915. The 8th Battalion was one of the very earliest units to be raised for the AIF, within two weeks of the declaration of war. It was recruited mainly from rural Victoria and with the 5th, 6th and 7th Battalions formed the Second Brigade. By 1916, when William Berkeley joined, they had already fought in the Anzac Landing as part of the second wave, taken part in the attack on the village of Krithia at Cape Helles, then in the Battle of Lone Pine. From here they were transferred to the Western Front, and on July 16, 1916, fought at Pozieres in the Somme Valley and then at Ypres, before returning to the Somme front for the bitter winter. It was probably at Ypres that William Berkeley joined them. He was unloaded at Marseilles, then taken on strength in August 1916, but spent most of that month in hospital with neuralgia. By September, he was fighting in Belgium, but on 11 November, 1916 he was in the Somme Valley, France, where he was fatally wounded in action. Described as either a gunshot wound to the buttocks or to the abdomen, he was stretchered out to No 38 Casualty Clearing Station, but died the next day, on 12 November, 1916. William Berkeley was buried at Healy Station Cemetery, 2.5. miles NE of Corbie, France. His name is listed on the Roll of Honour, Panel 52 of the Commemorative Area at the Australian War Memorial, Canberra. 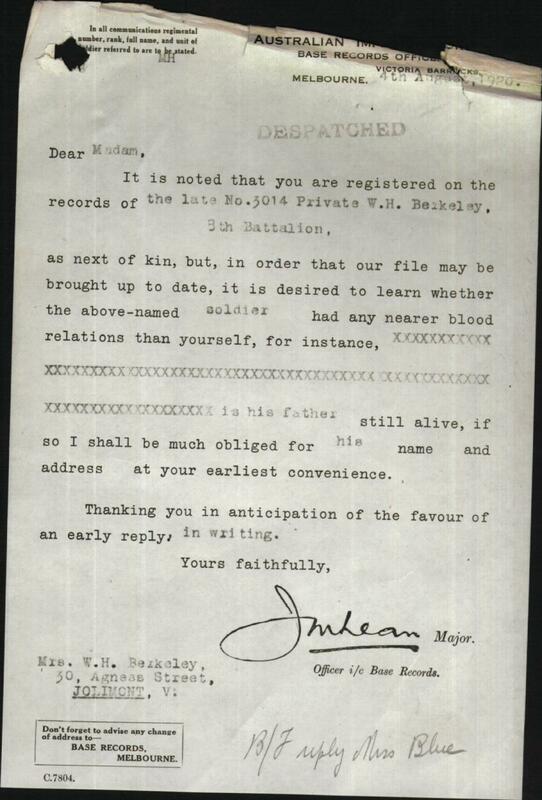 William Berkeley had incorrectly recorded his address on enlistment as 30 Agnes Street and most correspondence from the military departments dealing with his death in the fieldwas sent there. 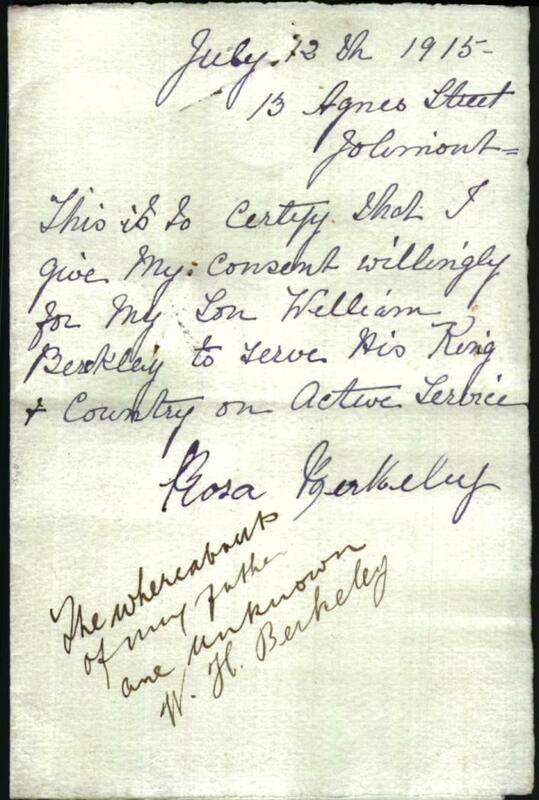 But from the beginning to the end, Mrs Rosa Berkeley's address was clearly 13 Agnes Street, as witnessed by the letters she wrote, both at the time of his enlistment and in correspondence about his death. She is also listed as living at 13 Agnes St. on the Electoral Rolls for 1914 and 1919, though by 1924, she had moved to 139 Hoddle St., North Richmond. The whereabouts of my father are unknown.